Behavioral medications can make a significant difference in the management of a variety of problems. Most important, they can help facilitate a positive outcome in otherwise complicated behavior cases. Your longtime client, Mrs. Jones, presents Buttercup, the Papillon, with “a behavior problem”: For several months, Buttercup has been biting houseguests. Through questioning and observation, you determine that Buttercup is anxious. She was “shy” as a puppy, exhibits fearful postures when unfamiliar people try to pet her, and—as a home video of her behavior reveals—runs away from guests trying to interact with her. The presentation of behavior problems during routine appointments is one of the inevitabilities of today’s veterinary practice. Behavioral drugs can help manage these problems—but not all drugs are equally useful, and their use is not always indicated. The plot thickens when some clients demand medication, while others refuse to use it despite veterinary recommendations (see Addressing Client Reluctance). My pet’s much-loved personality will change. This is not the goal. The only personality characteristics targeted for change with drug therapy are those associated with anxiety and reactivity, or such problems as repetitive (compulsive) behavior. Because psychopharmacology can have unexpected effects—for example, one client reported that her dog seemed less inclined to play with toys after administration of a drug—it is also important to reassure the client that his or her pet’s response will be monitored, and the medication effects can be reversed or limited by reducing the dose or switching to a different drug. Drugs are unhealthy or unsafe. There are many behavioral drugs, and most are quite safe to use—even with chronic administration—in healthy patients. Medication is prescribed only after a physical examination and, if the medication will be administered for a long period of time, screening blood analysis should be performed. Semiannually for patients over 8 years of age that are receiving behavior drugs, or more frequently if there are concurrent medical issues of concern. My pet will be sleepy all the time. Unless sedation is the goal, such as during thunderstorms for phobic dogs, nonsedating drugs are used, so sleepiness should not be an issue. If unexpected sedation is a side effect of behavioral medication, the drug dose can be reduced or a different medication can be prescribed. While it is not uncommon for behavioral drugs to cause transient sedation initially, it can often be avoided by starting with a lower dosage, then increasing it over several weeks to the desired dose. The treatment goal of any behavior problem is modification of that behavior. However, the term behavior modification is vague and depends upon the individual patient and behavior being addressed. Management of any problem behavior requires recognizing and avoiding the stimuli that trigger the behavior in question. The dog needs to learn to behave differently in response to the stimulus. The term differently is intentionally nonspecific because it is tailored to the individual animal and context in which the problem behavior occurs. Behavior modification might include anything from counter-conditioning a fearful dog; actively training an appropriate, alternative behavior to a cue; or desensitizing a separation–distress dog to its owner’s leaving the room. Thus, behavior modification can play an important role in management of a problem behavior. In some cases, there are limits to how far behavior modification alone can go. Extreme situational stress or fear can interfere with learning and decision making. When dogs are overtly reactive—or, in the language of dog training, over threshold—they are physiologically aroused, which involves both the autonomic (fight or flight instinct) and endocrine (hypothalamic–pituitary–adrenal axis up-regulation) systems. In these cases, there is rarely any middle ground—the dog will move rapidly from a lack of reaction to extreme avoidance, aggression, or panic. Temperamental or inherited generalized anxiety can also interfere with learning. Generalized anxiety, similar to situational anxiety, is more pervasive and challenging to overcome through training alone. Car or airplane travel (administered 30 minutes before travel; then repeated as needed during travel). Rather than administration on a daily or standing basis, sedative medication can be given on an as-needed basis, often in combination with a daily medication. WHEN SHOULD BEHAVIORAL MEDICATION BE PRESCRIBED? There is some flexibility with regard to prescribing medication relative to the behavior modification plan. If drug therapy is unequivocally indicated (eg, severe separation anxiety or severe fear, including fear-aggressive behavior), ideally prescribe it during the same appointment as the behavior assessment, which incorporates it into the entire behavior management plan. If the plan includes significant management changes that do not require medication and/or the pet is not impaired by stress (ie, pet has reasonably good quality of life at time of presentation), consider delaying medication implementation until a follow-up visit. In some cases, behavioral drugs may be unnecessary. If a pet undergoing behavior modification has reached a plateau with little advancement in learned tasks, successful desensitization, and/or counter-conditioning, drug therapy may allow the owner to move further toward treatment goals. Asking her to lie down on a previously specified mat while the owner is entertaining (alternative behavior). HOW SHOULD MEDICATION BE PRESCRIBED? Anxiety is an underlying component of many canine behavior problems (Table 1). Reducing this anxiety often improves the problem behavior directly or decreases stress, raising the threshold for reactivity, fear responses, and other behaviors. Before starting drug therapy in any animal, regardless of age, physical health, or category of drug, a medical history (including current medications) and physical examination are indicated, along with analysis of blood and urine. Longer-term therapy (eg, years for animals whose behavior is not adequately responsive to behavior modification alone). Length of time for medication to take effect: Some medications (eg, antidepressants) require 1 to 2 months for full effect, while others, such as benzodiazepines and other sedatives, act more immediately. Loading period: The initial loading period of some drugs should be considered when planning therapy and duration of treatment. Once it’s been determined that the patient’s response to medication is adequate, a reasonable duration of initial therapy would be at least 6 months, which allows a generous period of time for behavior modification (learning). FDA-approved drugs for use in dogs with specific behavior problems, such as fluoxetine (veterinary product no longer available) and clomipramine for separation anxiety and selegiline for cognitive dysfunction syndrome; however, administration for other behaviors, such as anxiety-based aggression, is extra-label. When recommending these drugs, inform clients that the use is off- or extra-label. It may be advisable to have the owner sign a release form that lists the risks, limitations, and potential adverse effects of the drug being prescribed. Abrupt discontinuation of medication may cause rebound anxiety or exacerbate behavior problems. Any medication should be tapered gradually (weeks to months, depending on duration of therapy); a good guideline is a 25% reduction every 1 to 2 weeks. Slow discontinuation also allows the owner to report any reappearance of the behavior problem, in which case a lower, but effective, dose can be continued or the original dose resumed. WHAT MEDICATION SHOULD BE USED? Tricyclic antidepressants (TCAs), such as clomipramine (Clomicalm, novartis.us) and amitriptyline. Selegiline (Anipryl, zoetisus.com), a monoamine oxidase inhibitor (MAOI) approved for treatment of canine cognitive dysfunction syndrome or senile dementia. Fluoxetine (no longer available as a veterinary product) and clomipramine were approved by the FDA for use in canine separation anxiety; either agent can be beneficial for other anxiety-related problems. Anxiolytic antidepressants should be given daily on a regular basis. Adverse effects may include agitation, increased anxiety, undesirable sedation, inappetence (fluoxetine), and lowered seizure threshold. Side effects may be dose-dependent; initiating treatment with a lower dose may help. Table 2 lists the behavioral medications for use in dogs discussed in this section, along with doses and side effects. Buttercup tends to be distressed during Mrs. Jones’ book club meetings and dinner parties, and is now often restricted to the back bedroom during these times. Administration of a sedative and a special, long-lasting, food-filled toy could help Buttercup relax and be less worried in these situations. In cases when sedation or an extra boost of anxiolysis would be helpful, shorter-acting drugs can be given on an as-needed (PRN) basis; examples are benzodiazepines (eg, alprazolam) or trazodone. Benzodiazepines are anxiolytic drugs and, used longer-term, can elicit anxiolysis without sedation. Trazodone can be dosed either regularly or PRN; an example of the latter would be its use in fearful dogs during thunderstorms. However, if used in combination with SSRIs, TCAs, or MAOIs, it should be used with caution due to the potential for serotonin syndrome (see Beware of Serotonin Syndrome). Benzodiazepines are often useful for PRN sedation in cases, such as separation anxiety or thunderstorm fear, when a focused need for anxiolysis is needed. Side effects include polyphagia, aggression disinhibition, and paradoxical agitation and ataxia without adequate anxiolysis, and may be dose dependent. The dose range tends to be wide; owners can use a starting dose while they are home to observe, and increase the dose on subsequent days with veterinary guidance. The goal should be relaxation and mild sedation. Drugs in this class may vary significantly in their clinical effect for individual patients. 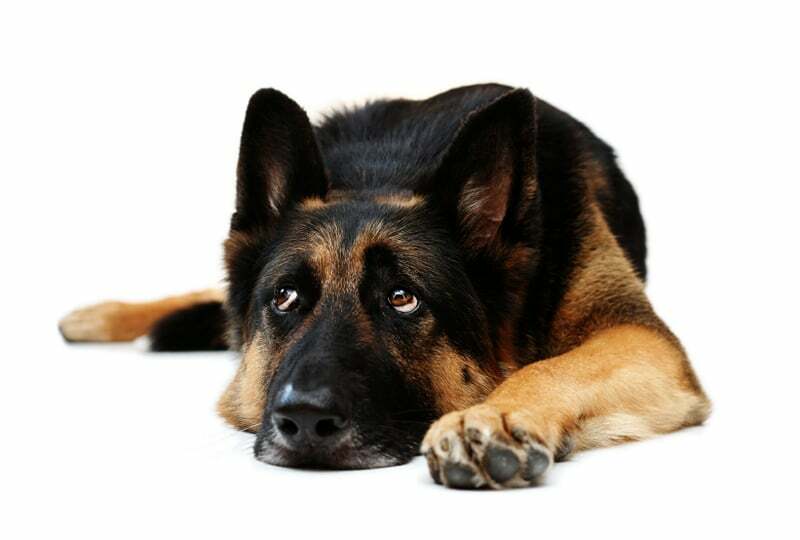 Alprazolam is relatively short-acting and, therefore, may be useful for separation anxiety (because affected dogs are typically distressed just after owner departure). Clorazepate is longer-acting and perhaps more useful overnight or when a thunderstorm is predicted several hours after administration. Because trazodone, SSRIs, TCAs, and MAOIs boost serotonin levels, their use in combination (any 2 of these drugs together) may potentially trigger serotonin toxicity, or serotonin syndrome, a potentially fatal reaction. Tell owners to watch for early signs of serotonin syndrome, which can be ambiguous, but include agitation, tremors, and seizures. At the doses typically used in veterinary behavioral medicine such reactions are rare, but the potential for them indicates monitoring the dog’s response. Buspirone, a nonsedating anxiolytic, can be useful for generalized anxiety. Because it has been anecdotally associated with aggression disinhibition, it may be best limited to treatment of anxiety with no history of aggression to humans or to other dogs. However, it is important to keep in mind that any psychotropic drug may cause increased agitation or aggression. Standing antidepressant + benzodiazepine + trazodone. However, monotherapy with an antidepressant (or the PRN benzodiazepine) is recommended initially so that side effects can be identified and linked to the drug being administered. To further effect anxiolysis or other behavior change, nonpharmaceutical agents can also be added to therapy (Table 3). It is sometimes too easy to think that a medication or combination of medications will do most of the work, when in fact management changes, safety practices, and re-learning are needed for a successful outcome. Unfortunately, administration of a behavior drug often pushes these efforts to the back of the line. Follow-up is critical in management of behavior cases, not only for dose adjustment and changes in choice of drug, but also for feedback on modification, implementation, and progress. Address any confounding or comorbid medical problems associated with the behavior problem, including pain, sensory decline, or hypersensitivity. The client should also be forewarned that patience will be needed, especially while waiting for the drug to “load” over the course of 1 to 2 months. If the medication is being administered at the correct therapeutic doses, and there still is no measurable change—decreased frequency or intensity of the problem behavior—it may be necessary to taper and discontinue that medication; then begin a new one and start the wait again. This lag period can be helped by use of a more immediately effective anxiolytic, such as trazodone, but consider educating clients that the beginning of drug administration can mimic a long ride on a slow-motion roller coaster. Creation of a separate “safe haven,” where she could indulge in feeder toys. Human-directed aggression is the most common canine behavior complaint; fear or self-defense is the most frequent reason for aggression. Although clients may naturally assume that anti-anxiety medication can resolve this problem, remind them—ideally in a written document—that there is no reliable “cure” for aggressive behavior, and no drug will prevent biting. More important than any medication is the need for clients to understand safety recommendations, avoidance of triggers of aggression, and the application of behavior modification, including both classical and operant conditioning. It should be emphasized that punishment or other harsh training methods, including shock collars and outdated “dominance” exercises, can backfire by increasing defensiveness and the likelihood of further biting.In any animal with a history of biting, the risk for future bites can never be entirely eliminated. Owners may not want to face the prospect of permanent caution, but nevertheless it is important to emphasize safety and preventive measures.Read Dog Bites: Protecting Your Staff & Clients (November/ December 2011) for further information, available at tvpjournal.com. I lana Reisner, DVM, PhD, Diplomate ACVB, is a veterinary behaviorist and consultant in Media, Pennsylvania. She has served as the director of the Veterinary Behavior Clinic at University of Pennsylvania Veterinary Hospital and assistant professor of behavioral medicine at Penn’s School of Veterinary Medicine. She is past president of the American Veterinary Society of Animal Behavior. She received her DVM from Oregon State University and her PhD from Cornell University.